Echinops is often overlooked as a cut flower but there are few plants that you can add to the vase that lend such a distinct flavour to the whole affair. Their spiky flower heads look like medieval weaponry…and the silver blue metallic sheen adds a sort of futuristic vibe. My own favourite and in fact the only variety I sell in seed form is ‘Ritro‘….it can self seed like a trooper….which of course can be a good thing or a bad thing. Best to have a dedicated patch if you can spare the space. Thanks to @BessyBrad (Twitter) for sharing this pic, taken at the weekend. 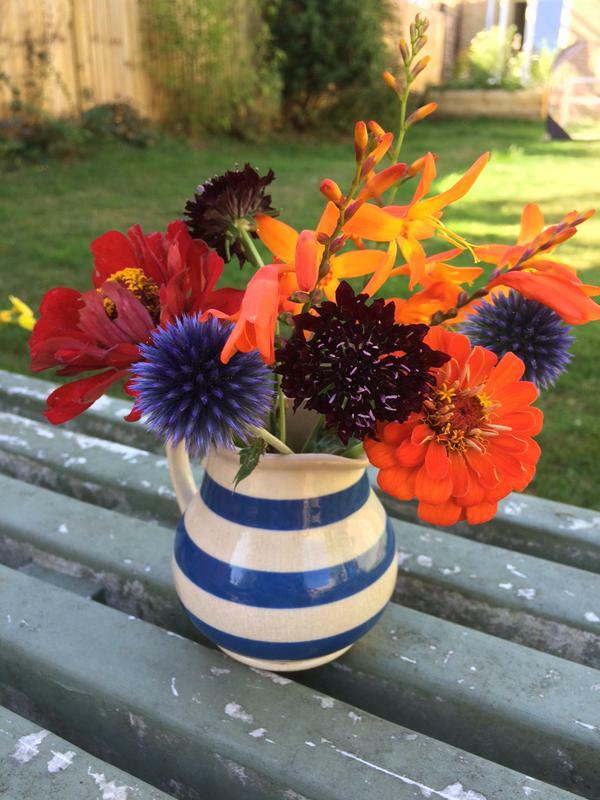 In the photo above you can see how a simple arrangement of a few stems can bring joy to the cockles…the cool blue of Echinops really stands out….and a very handsome Cornish Ware Jug if I’m not mistaken. ‘Ansome! 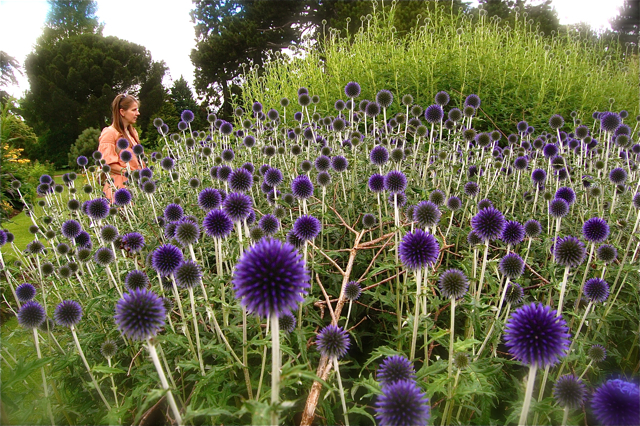 Echinops in the Cambridge Botanical Gardens. *I tend to sow mine in pots in the spring but you can sow from late Autumn too. *Sow in pots no smaller than square three inch pots as the roots of Echinops need a bit of wiggle room to keep them happy. *I plant out my spring sown seedlings after the frosts about a foot apart….bear in mind they won’t flower in the first season but will reward you with heaps of blooms from there on in. *Echinops are happy in a wide range of soils but seem to prefer well drained ones. *Harvest the first flush of flowers and a second flush will trot along in a few weeks time. Echinops ‘Ritro’ seeds can of course be found in the Higgledy Shop Of Seedy Love. If you are looking to sow up a cutting patch in late summer then please visit: ‘Seeds To Sow in late summer & early autumn’. Rudbeckia, The Late Summer Rockstars. Cleome ‘Violet Queen’. Spider Flower. Half Hardy Annual.